This a close look at the attractive Ledebouria galpinii. 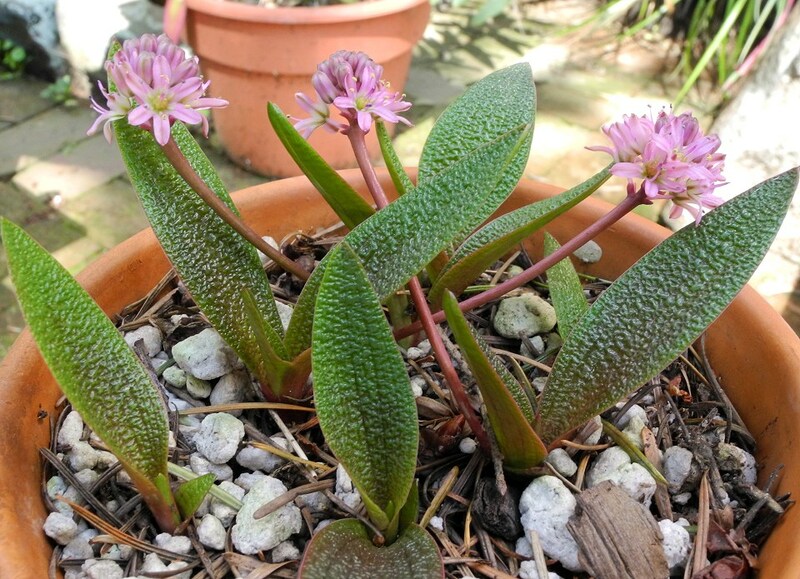 This unusual Hyacinth relative has really cool leaves that are deeply pitted and glossy. Each spring it sends up a mini bouquet of magenta & yellow blossoms atop red stems. This is an endangered species from a tiny section of mountains in eastern South Africa. Fortunately it is easy to grow and makes a great houseplant in a small pot. It is uncommon in cultivation, and rarely seen for sale. The bulb is a beautiful amethyst color, and may be grown partly exposed. Over time it multiplies to make a nice colony of plants. It usually makes 2 to 4 leaves that are tinged with red. The leaves grow larger in shadier conditions, while in sunlight, they darken up to a deep, dramatic purple or bronze, as seen here. The leaves have an oily sheen that shows off their uniquely pitted surface. The plant goes dormant for 3-4 months in winter, and then emerges in spring with its pretty, 3 inch flower spike. 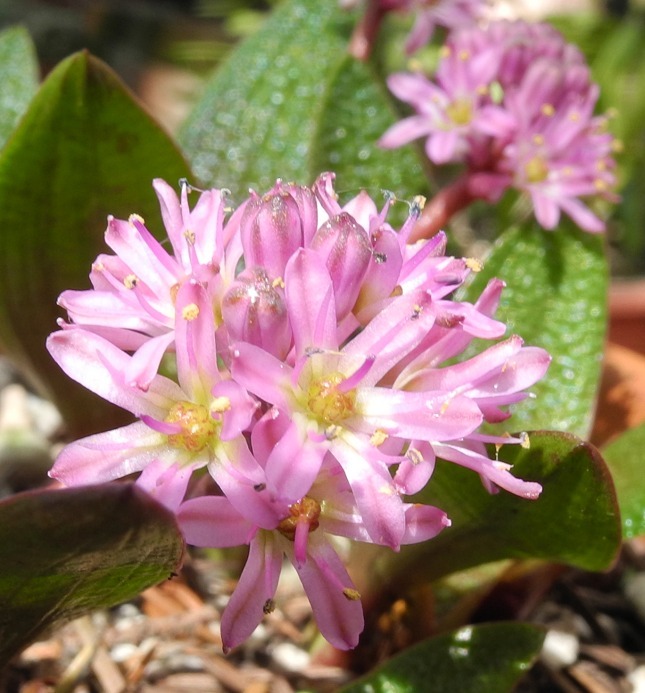 These delightful blooms are purplish-pink, which can vary in hue depending on the temperature. The plant has been steadily disappearing in the wild due to habitat loss and could become extinct in the next 10 years. Its habitat is subtropical, with mild to warm conditions during the summer growing season. It should be able to handle hotter conditions if nights are cool. It grows well in filtered sunlight or morning sun + bright shade. It might need some protection from strong afternoon sun in hotter areas. It grows well in a 4 inch (10 cm) pot in a sandy soil mixture. A typical mix is 3 parts coarse sand to 1 part potting soil. Keep the soil evenly moist during periods of active growth, and almost dry during the winter dormancy. In the right conditions, it's an easy bulb.